The new inductees are: David Blue (posthumously), John Chan, Tom Ghent, Lloyd Kaplan, James Montgomery, Paul Murphy (posthumously), plus Andrew Polin, Bob Morrissey and LeRoy Bennett in the Technical/Lighting category, and jazz performer Mike Renzi. The inductees will be profiled in a near-future issue of this very periodical! Three events take place in April to honor these artists. RIMHOF Folk and Songwriter inductions honoring Tom Ghent and David Blue, feature a performance by Tom Ghent and a tribute to David Blue by earlier Hall of Fame Inductees Mark Cutler (2015) and Bill Harley (2016) at POP! Emporium of Popular Culture, 219 Park Street, PVD on Apr 27 at 7pm. jazz performers, including Mike Renzi. On Sunday, Apr 29, the exhibits honoring the inductees will be unveiled at the Hall (literally, a wide hall) at 2pm. followed by a 3pm concert at The Met (both in Hope Artiste Village, 1005 Main St, Pawtucket). The James Montgomery Band will be performing followed by a Paul Murphy Tribute jam session featuring many past RIMHOF inductees as well as musicians who collaborated with Paul over the years. This event will also highlight Andrew Polin, Bob Morrissey and LeRoy Bennett for their contributions to the evolution of lighting in the field of music (if you ever have a chance, ask RIMHOF historian Rick Bellaire for a history of lighting design in music performance – he’ll act it out, covering the days when musicians used whatever was available, through the days of colored lightbulbs from Benny’s, in portable boxes, to the intricate computer-controlled set-ups of today). 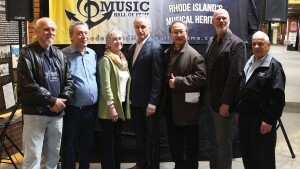 “We continue to showcase the fascinating history of Rhode Island’s musical heroes,” reflects RIMHOF chair Bob Billington, reminiscing about how many exhibits now populate the Hall, and how empty it seemed a few years ago, when the organization began its work. There are now 63 exhibits in place, making the Hall a worthy destination, even when there aren’t remarkable concerts happening next door.